Residential and Commercial Exterior Cleaning Services! Pristine Clean offers a whole range of Exterior Cleaning services for both Commercial and Residential requirements. The range of cleaning services we offer includes Windows, Doors, Frames & Sills, Driveways, Patios, Pathways, Block Paving, Decking, Gutters, Fascias, Soffits, Greenhouses, Carports, Lean-tos, Garden Furniture, Cladding and more. Our most common contribution to possible environmental damage is the use of detergents when carrying out Traditional Window Cleaning, as detergents have been identified as polluters of groundwater and river water. 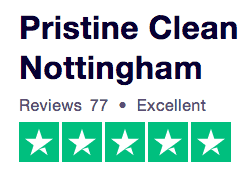 At Pristine Clean Nottingham, we take our responsibilities seriously, and even though it’s only a small contribution. The water-fed pole system is our most used window cleaning method, that only uses de-ionised water. The filters in the filtration system we use to produce the de-ionised water do need to be replaced, which we send back to our suppliers for recycling. Family run business by Husband and Wife. We offer a FREE no obligation quotation service and are happy to make suggestions about how to make the most of your property or premises. We’re happy to visit or for a quicker quotation, 90% of the time, we can provide quotations with the photos that you provide. We hold Public and Employers Liability Insurance which is reviewed on an annual basis to ensure that we are covered for any eventuality. A copy of the policy schedule can be provided upon request. We take our business very seriously and only want to provide you with the best service and the best possible results. We are happy to provide references upon request but also feel free to visit our testimonials page to see what some of our customers have already said about us.